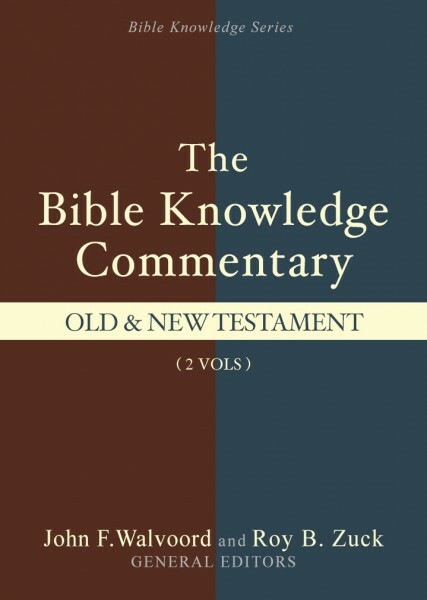 The Bible Knowledge Commentary on Old and New Testaments - popular in style and scholarly in content - will deepen your understanding of God's written Word. Discussing the Bible verse by verse and often phrase by phrase. What does that verse mean? How should I interpret this passage? What is the significance of this word or phrase in Greek or Hebrew? How do Bible-time customs help me understand the meaning of this passage? How can this alleged contradiction be explained? How does the information on the author, historical background, and features of a Bible book help interpret that book? The Bible Knowledge Commentary will be welcomed by a wide spectrum of Bible students, from the beginner, who will find it easy to understand and easy to use, to the advanced, who will find it consistently thorough and reliable. The readable style, combined with careful scholarship, make this a Bible study aid its users will add to their "most-used" shelf of books. Note: This version of the Bible Knowledge Commentary does not contains the maps, charts, or images of the print version at this time.